Members of white nationalist groups gathered around a statue of Robert E. Lee during a rally in Charlottesville, Va., on Aug. 12, 2017. Chief Magistrate Judge Joseph Spero of the Northern District of California has allowed the subpoena to move forward, ruling that the user's right to anonymity is outweighed by the importance of investigating a possible violent conspiracy. But the real name of the user should be revealed only to a small circle of people involved in the court case, Spero said. Doe's lawyer, Marc Randazza, tells NPR that it will be his client's decision whether to appeal but that he is inclined to recommend it. "I don't like what my client had to say," he says. "I don't like my client's views. All you've gotta do is look at the username. ... But I have a more strong opinion that you have the right to do that. You have the right to be extremely right-wing. That's what America is. You have the right to be a raging full-throated Nazi if you want to be." "Somebody has to stand up and say they have the right to do this," he says. The decision comes days before the "Unite the Right 2" rally in Washington, D.C., and in Charlottesville, a follow-up to the protest last year. Anti-racist protester Heather Heyer was killed by a self-described neo-Nazi who drove a car into protesters at last year's rally. Jane Doe is not a defendant in that lawsuit. But her name — or rather, her pseudonym — came up in efforts to get more information about how the rally was planned and carried out. Kristall.night appears to be a play on Kristallnacht, the infamous night of Nazi attacks on Jews in 1938. Court documents state that she also made racist statements such as "Without complicit whites, Jews wouldn't be a problem" and "I hate miscegenation so much more after actually talking to mixed race people about their identity." Kristall.night, or Doe, argues that she has First Amendment rights to anonymity and association that would be violated by the subpoena. She also says she was not issuing instructions but rather advice, and she calls the Discord subpoena a bad-faith "doxxing" effort designed to reveal her identity and ruin her life. Spero, the judge, agreed that Doe has a right to anonymous speech but noted that this right is not unlimited. In this case, he said, "the importance to the case of disclosing Doe's identity outweighs any burden on this right." Spero ruled that the content of the Discord messages can't be released without the permission of either the sender or the recipient. Roberta Kaplan, whose team of lawyers represents the plaintiffs in the Virginia case, tells NPR they have already received the permission they need to access chats they are targeting. Meanwhile, the other information about Doe's account — including identifying information — must be released as part of the lawsuit, Spero says. Those data must be treated as "highly confidential" information that can't be shared with the public, or even with the plaintiffs in the case, the judge said. Randazza, the lawyer for Doe, told NPR he is skeptical of that promise. "I find the judge's confidence in the plaintiffs' lawyers doing the right thing to be quaint and charming," he said, "but I don't share the judge's optimism." As white nationalist organizers and counter-protesters get ready for Unite the Right 2 rallies this weekend, the court battles from last year's violent rally in Charlottesville, Va., still are not settled. A federal judge just ruled that a woman accused of planning violence at that rally cannot keep her identity hidden from the courts. NPR's Camila Domonoske reports. CAMILA DOMONOSKE, BYLINE: Discord is an app that makes it easy to chat anonymously. It was designed for gamers. 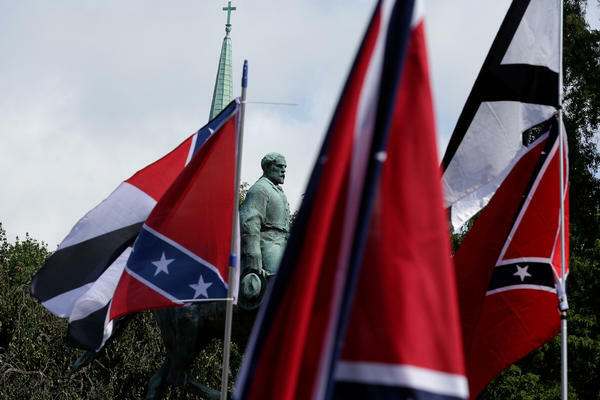 But last summer, lawyers and activists say it was also used by white supremacists and other members of the so-called "alt-right" to plan the Unite the Right rally in Charlottesville. One counter-protester died at that rally, and others were wounded. Some of the people who were hurt are suing the rally's organizers, and they're very interested in what went down in those Discord conversations. But so far, they've only been able to see some of the chats which were leaked. Roberta Kaplan is one of the lawyers bringing that lawsuit. ROBERTA KAPLAN: We have now gone directly to Discord to say we want the complete picture. DOMONOSKE: That is, they want all the secret chats about planning for the rally and the identities of the planners. A woman went to court to try to stop the release of those Discord records. She's not being sued in the case, but she was involved in those planning conversations. She's called Jane Doe in the court documents. But on Discord, she went by kristall.night. Kristallnacht of course was the infamous night of Nazi attacks on Jews in 1938. Kaplan says that kristall.night used the app to give advice to Unite the Right protesters. KAPLAN: She told people - I'll give you an example - don't bring weapons you're inexperienced with using in a fight in a crowded area. Do bring a tourniquet, shields if you have them, a helmet. DOMONOSKE: In her court case, kristall.night said she has a First Amendment right to anonymity. She also worried her identity might be revealed publicly, resulting in harassment. But the judge said her First Amendment rights are not absolute and that in a case of alleged violent conspiracy, public interest outweighs the harm to her rights. The judge said that her identity should only be shared with the lawyers in the case. Jane Doe's lawyer has previously argued that a court order protecting her identity is insufficient because the lawyers involved might leak her name anyway. Kaplan says her goal was never to reveal kristall.night's true name, that she's investigating a conspiracy, not one woman's identity. Camila Domonoske, NPR News. Transcript provided by NPR, Copyright NPR.